Since the brewery does not prepare food, patrons are allowed to bring in outside food, as well as have food delivered to them at the brewery. We also offer the following snacks and beverages. We offer handcrafted maple nuts from the Detroit Gourmet Nut Company. Guests can choose from walnuts, pecans, or cashews! Pop Daddy Popcorn is made right here in Michigan with premium ingredients. We commonly stock flavors of such as Daddy O, Hot Daddy, Sugar Daddy and Pepper Daddy. Great Lakes Potato Chips are skin-on chips from Michigan potatoes made in Traverse City, MI. These chips are cooked in small batches with old-fashioned kettle chip goodness and tasty flavors. Fresh baked soft pretzels from Sunflour Bakehaus located in Downtown Farmington. Cheese Lady cheese and crackers from the Downtown Farmington location has an impressive selection of 150 artisan cheeses from all over the world. We currently serve 2-3 of these flavors which change regularly. We donate some of our stouts or porters to Sunflour Bakehaus located in Downtown Farmington. They make us some delicious brownies! We keep several flavors of Snyder's Hard Pretzels on hand for nibbling. Selection of nibbles including cheese, cold cuts, gherkins and more from the Cheese Lady. In addition to our craft beer selection, we also offer Chardonnay and Malbec. Guests may also bring in their own bottle of wine for a corking fee of $12. Check out our current brews on tap now! Faygo Pop is made right here in Detroit, MI. We offer lots of flavors including Red Pop, Rock N' Rye, Orange, Root Beer, Grape, Cream Soda and more! On tap from Neu Kombucha located in Downtown Farmington. 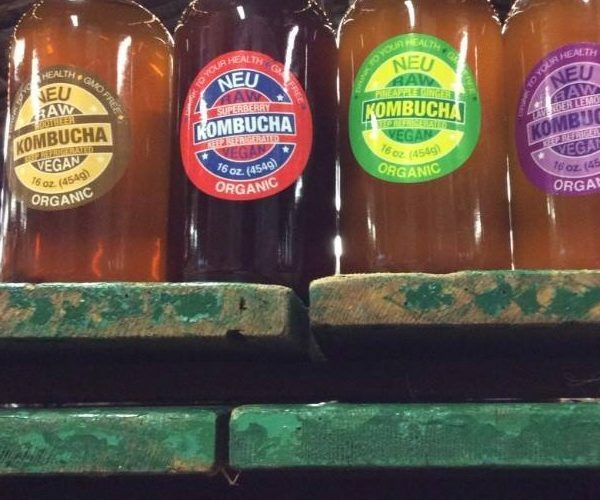 Kombucha is a fermented tea that is a nutrient-rich tonic, as well as a refreshing beverage which dates back 2000 years with Asian origins. It can contain trace amounts of naturally produced alcohol, about 0.3% to 0.5%.